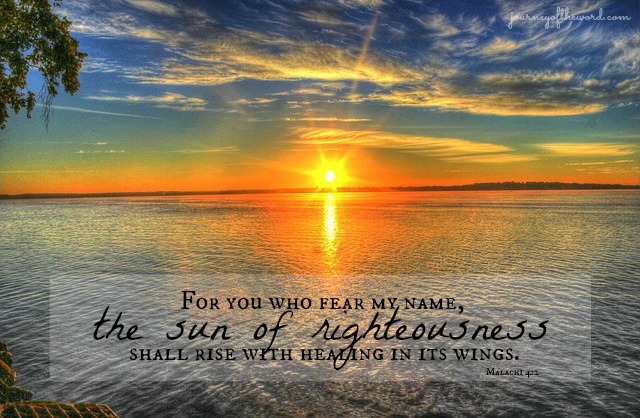 The sun of righteousness. This must be Jesus. Jesus is righteous. Jesus brings healing. Jesus is a son. Is Jesus a sun? How can a sun be righteous? Same sun. It rises and sets. Like every other sun you’ve seen. But this sun (4:2) is righteous. And it heals. It heals those who fear the name of God. A sun that heals. Like a heating pad to an ache. Not like the burning of an oven. This is a scorching. Destruction. Wound upon wound. This is not healing. This is judgment. But imagine a sun of righteousness. That’s Jesus. The powerful Healer of all things right. In the day when rebellious sinners are turned to ashes by a blazing fire and by burning, Healing comes, shining bright and warm upon the broken and weary. He rightly judges. He rightly rules. And like a soothing heat, He rightly heals those who fear His name. So that they can run. Free and victorious. The thoughts I think as I read Malachi 4.